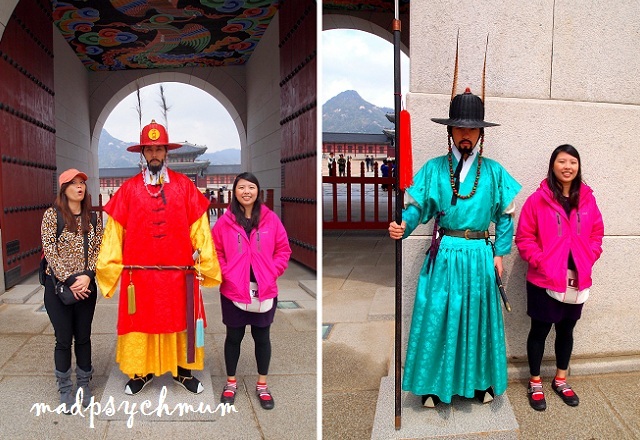 After breakfast at our hotel this morning (we were too tired to walk), we took the subway from Chungmuro Station to Gyeongbokgung Station (Line 3), Exit 5, to visit the Gyeongbokgung Royal Palace. One of the most famous palaces in Seoul, Gyeongbokgung means “Palace Greatly Blessed by Heaven” and has the longest and most storied history of any Korean palace. The new structures made up the massive complex with 5,792 rooms, taking up 4,414,000 square feet (410,000 square metres) of land. Phototaking with the guards, who take their jobs very seriously! Although a ticket to the palace costs only 3,000 won (approximately S$3), the family wasn't too interested to go in and take a look. 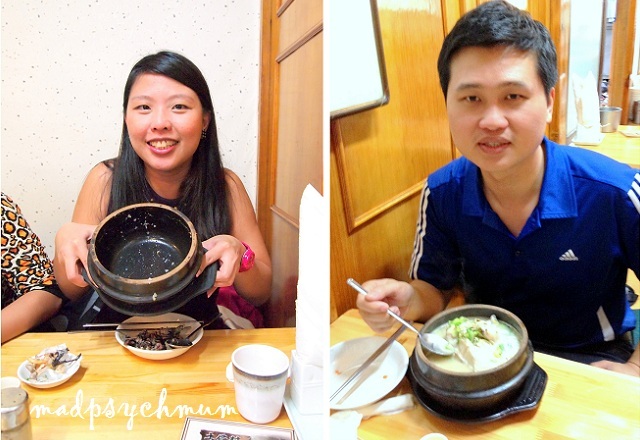 They were however excited for a good lunch so we made our way to Tosokchon Samgyetang (address: 85-1 Chebu-dong, Jongro-gu, Seoul), which was recommended by my friend A as the best restaurant for ginseng chicken. To get there, walk back to Gyeongbokgung Station and walk out via Exit 2. Walk straight for about 120 meters towards Hyoja-dong and look out for this house (see below) on your left. They only sold ginseng chicken soup (the power of speciality is evident and very common in Korea and Japan) in 3 different grades so we ordered 3 of the regular grade and 1 of the premium grade ginseng chicken soup, which was supposedly for my mum but she later allowed me to finish it as she said it was good for nourishing my body since we were trying for a baby. My family was initially skeptical with regards to the quality of the soup here (they were like, "sure good or not?") but after taking a sip from the pot, they were sold! 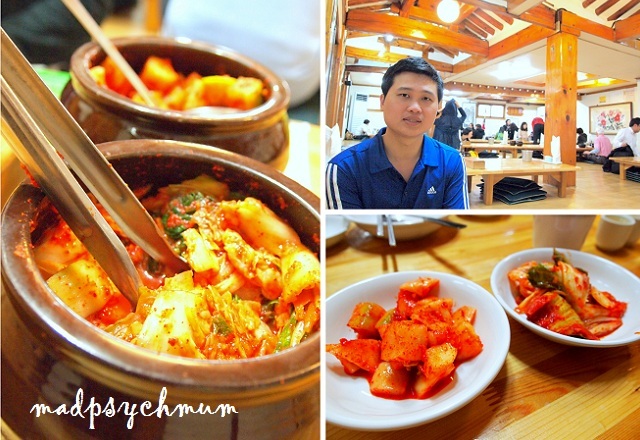 I personally preferred the premium ginseng black chicken to the regular soup and definitely highly recommend it! It was so good I finished every last drop! 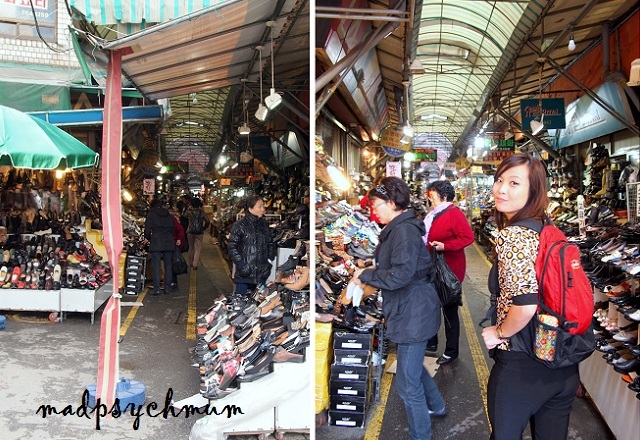 After a very fulfilling lunch, we decided to do some last minute shopping at our favourite shopping districts we've visited the days before. Starting with Dongdaemun, we took the subway from Gyeongbokgung Station (Line 3) to Jongno 3-ga Station and transferred to Line 1 to Dongdaemun Station. Of course you need to grab shoes to go with your socks and there are rows and rows of shops selling super cheap shoes here! Tons and tons of shoes! 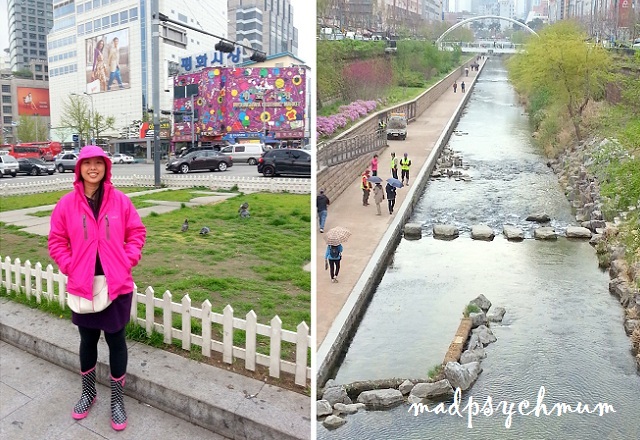 And I thought this small river in the middle of Dongdaemun was unexpectedly beautiful as we don't see this in Singapore (we've only got smelly canals here!). The next stop of our last minute shopping was Namdaemun Market (Hoehyeon Station, Line 3), where we bought more seaweed and other souvenirs. Finally we settled at our favourite restaurant near our hotel for one last BBQ dinner! 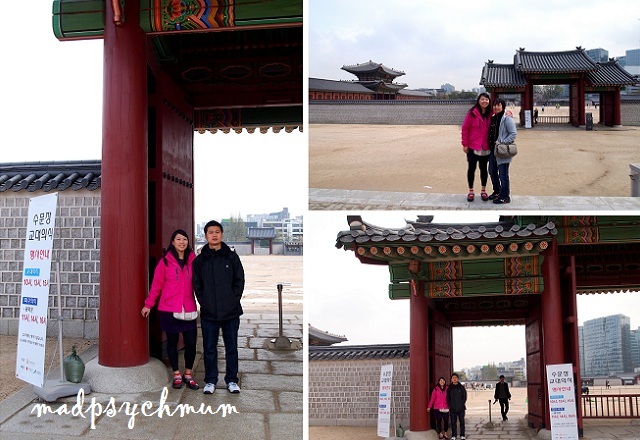 Continue to >> Seoul Day 7: Don't Want to Leave!